Doctors and nurses exchanging tense, meaningful dialogue! A gurney rumbles down a corridor, surgical instruments clatter, and a rubber glove snaps at the end of a life-saving operation! Here is medical drama at its best -- tense, taut, and intensely human! Lew Ayres stars as Dr. James Kildare, an intern at the start of his medical career, who takes on the hectic routine of a major metropolitan hospital. 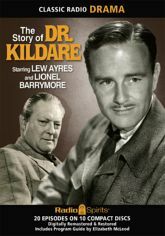 Lionel Barrymore co-stars as his gruff-but-kindly mentor Dr. Leonard Gillespie.